We slept a solid 5 hours last night, but at 5:30 we were all wide awake, so we got up and took much needed showers. 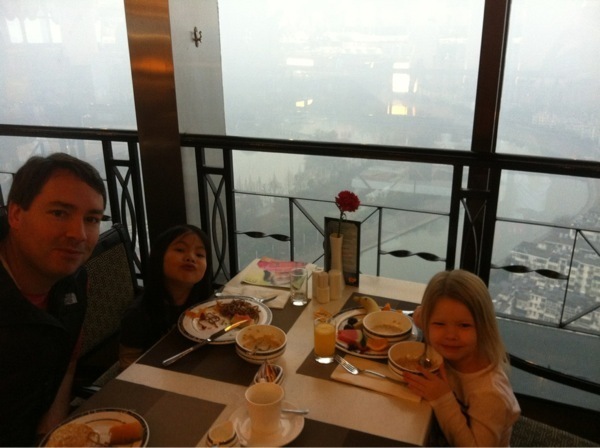 Then we went to the top floor of the hotel (Holiday Inn Hefei) and ate breakfast in the rotating restaurant. It was one of the great breakfast buffets of all time and is included with the room. Needless to say the hotel is very nice. We have two adjoining rooms and they are well furnished. Thanks for all the prayers and encouragements. We have no access to Facebook or Twitter (although I am getting email notifications when people mention me on Twitter). I'm trying to figure out a way to circumvent this, but I'm not hopeful. You can email us or post in the comments on this site, also FaceTime works perfectly and I'm on Skype as derekbonesteel. I'll post some humorous China observations later.